View cart “White, faceted Agate in Sterling Silver” has been added to your cart. Falling Apart Necklaces came about due to Jane Magon reconsidering the traditional CONSTRUCTION of necklaces: the notion that necklaces are always ‘put together,’ in order to be worn. The necklace that is meant to appear to fall apart and is yet still somewhat connected (in order to wear it). However, it looks as if it is falling apart. 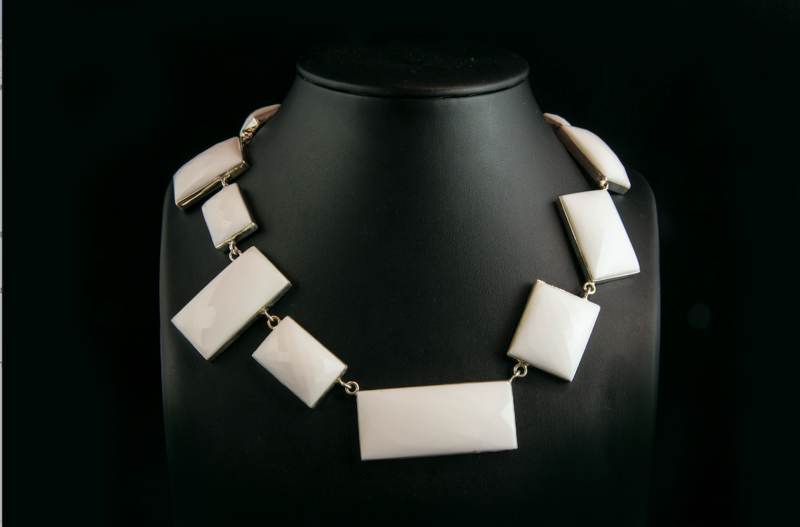 Jane has ‘tipped’ and juggled the slices of faceted white agate of different sizes of rectangular shapes at indiscriminate angles to ‘deconstruct’ the traditional ‘order’ of a standard necklace. The white agate is bezel set in sterling silver with a ‘hidden sterling silver clasp’ set with faceted white agate that blends in with the necklace. Is it constructed – or deconstructed? Unique, dramatic, minimalist ‘ Falling Apart Necklace’ is designed around the concept of ‘deconstruction’. Where most necklaces are ‘constructed’ – this necklace is built around the concept of ‘falling apart’. The stone is immaculate, faceted white agate (with a subtle manner of catching the light) set in sterling silver bezels & matching ‘hidden’ clasp. It is a very striking and unusual necklace that can be worn with black, white, prints and all colours.